If you have been all curious for having a proper glimpse of the revamped 2013 Fiat Linea then the time has come for you to get a 180 degree view of this facelifted model since the official images have already hit the internet. 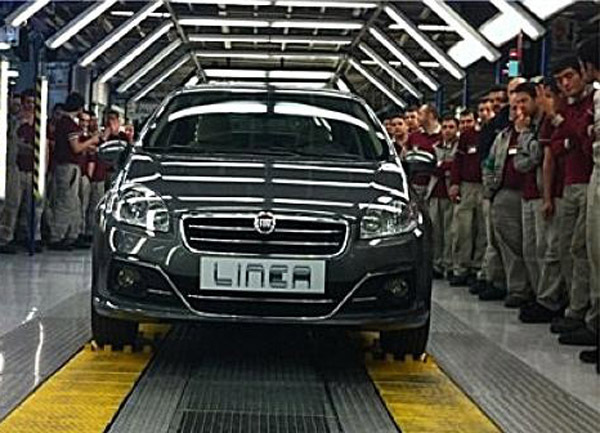 An extremely camouflaged version of the 2013 Fiat Linea had been snapped previous month as the revamped model is being made at the Fiat’s facility in Turkey. As seen from the pictures over the internet, the new Linea is coming with some magnificent updates in design. The car is adorned with front chrome grille, chrome bumpers and huge headlamps while the minute chrome detailing does not finish on the front fascia only, but it has its effect on the rear end as well on the boot lid and the rear bumper. Looking at the pictures it seems that Fiat has taken some sort of cues from the Indian audience as they are great admirer of outlines that is done on chrome. The Multijet 1.3-litre engine, which is beneath the bonnet of the current version of Fiat Linea is also getting a little bit of enhancement to deliver a better fuel efficiency with low level of CO2 emissions. The portfolio of the latest Linea will be extended with a new powertrain, which is a high class Multijet 1.4-litre engine. This new powertrain unit is there also beneath the bonnet of the Alfa Romeo MiTo and it can produce 168 HP of total output with ease. However, the Indian subcontinent has to wait for this new version of Fiat Linea as the firm has already launched the 2012 Fiat Linea in the country on the occasion of 2012 International auto Expo at New Delhi this January. The revamped version of the Fiat Linea will be hitting the dealerships of South America and Russia first, where the brand has an eminence in comparison to the Indian automobile market where it is still exerting itself to find a proper place.